Okay, I have to admit it. I hate it when people refer to every text as a "story". I understand that it's second nature. After all, when I was growing up, our reading class was organized around the basal reader. Every week we read the next story. So I was conditioned to call any piece of text longer than a paragraph a "story". But not every text is a story. In the past few years, I've tried to be more careful when talking about text with kids. The word "story" does slip out now and again, and I correct myself. It's important to me that kids associate the word "story" with the parts of a story grammar. Using this word to describe an article would send the total wrong message. Part of the problem, of course, is the question of what else to call these texts. If you look at the literature, you'll see that there are many different ways to refer to texts, just adding to the confusion. Here's a quick rundown. The difference between fiction and nonfiction is easy. Fiction texts are not strictly true (while they may contain true events or real people), while nonfiction texts are based on facts. These distinctions are based on what is in the text. Sometimes, a reader has to read very carefully to figure out if something is fiction or nonfiction. 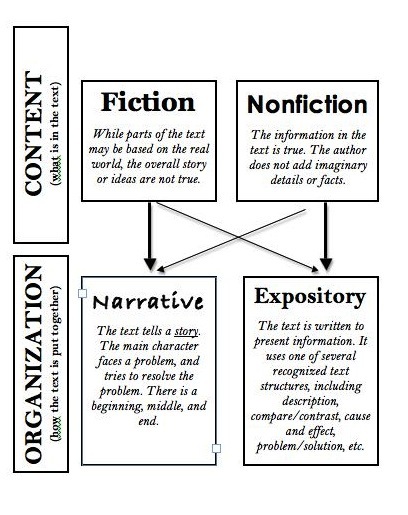 The differences between expository and narrative text are not as well-known (even to other teachers, I've discovered.) Narrative texts tell a story. It's easy to find a beginning, middle, and an end. Usually, narrative texts have characters, settings, conflicts, and a theme. In the classroom, it's sometimes easy to use "nonfiction" as a shorthand for "expository". It's true--most expository text is nonfiction, and most nonfiction text is expository. But biographical and autobiographical writing is a notable exception. A personal narrative, for example, is a true account of a story from someone's life--a nonfiction narrative. At the same time, I've seen more and more expository fiction lately. Many students like to read encyclopedic style guides to comic book characters. These guides follow an expository structure, but convey fictional information. This points to teaching students the words expository and narrative, of course. Some teachers don't like to do this because it adds to the overall vocabulary load of students, and I can understand their point. I think that fourth graders can easily handle it. Teachers in younger grades, I'd love to hear your thinking on when these terms can make their way into the language of the classroom. So what do we call it? Instead of using the word "story", what should we call texts? Well, I usually fall back on the word "text". (Make sure that you teach this word early in the year. 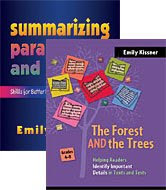 If you work with ELL students, show them the difference between "text" and "test".) I also throw in the words selection and passage, as these are likely to show up on standardized tests. And, of course, there is much to be said for sending the question back to the students. What should we call this piece of text that we're looking at? What does it remind you of? How is it similar to other texts you've read? Even if they do not know the strictly correct terms, they can often give texts names that will help them to make connections across genres. "Can I have that book that tells you what different things are?" one kid asked when he wanted a field guide. "You know, it has pictures, and tells you names." Another student, when browsing through picture books, noticed that some had people on every page, while others didn't. Were these fiction/nonfiction? Narrative/expository? It would be interesting to find out. As I unpack my classroom this August after another classroom move, I know that I'm going to leave my classroom library slightly disorganized. Looking at these kinds of text in the first week of school--and talking about how we can put them in categories--will be a great way to start the year. Love this! I'm guilty of explaining too much! I'm definitely going to use some of your idea. Thank you! This is a great visual that you provide. Thank you. 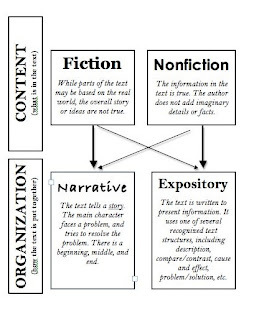 Though students seem to understand each of these concepts (fiction, non-fiction, narrative, expository) in isolation, when they are all in play at once, confusion arises! I will definitely be borrowing your chart to help explain the concepts to my students next year. Mam Danny, October 9, 2012. Hi Kissner, thanks for your article above, it's for resource to teach my secondary students. Let me introduce before, I am Mam Danny, an english teacher of SMP 1 Bangsalsari, East Java, Indonesia.Would you like to write simple explaination about descriptive, narrative, recount, report, procedure, and expository text with the sample and the questions of each genre text. I will present your blogg (explaianation) to them. I think that they will be proud of you cause of getting material from the native directly. Could you join us? Hm... I guess that it will increase their learning motivation. Are you in line with me? I would be happy to write some materials for you! Send me an email at elkissn@gmail.com and I can send some texts for you. My students would be very interested to hear about your students as well. hi mam i am very hapyy to know about this website, now i would chek it out daily, i have sent u an e mail if you could please check that. hi um were could i get expository text examples?? Please write to me at elkissn@gmail.com and I can send you some expository texts. Good luck! Thank You! This is a great read; I'm a teacher in training and I will be sure to keep this information on hand. Omg! I jus read this and I love it. I'm a grad student in a creative writing MFA program and I was looking for an easy way to explain the difference between non-fiction and creative non-fiction. Your blog post was perfect! Thank you! Thank you so much. Do you know anything about Hybrid nonfiction? Hybrid nonfiction is simply nonfiction that contains characteristics of multiple genres. There doesn't seem to be one consensus of a definition for hybrid nonfiction, with some authors calling narrative nonfiction "hybrid" while others reserve the term for texts that might include poetry, how-to, and other genres with true facts. One of the best explanations that I have seen (in grade two) is this: expository writing you need to prove by giving reasons and examples. For example: if you say that opera is fun, you would need to follow that up with "There are beautiful costumes. The singers act at the same time. The story makes you feel as if it is real." Narrative, on the other hand is "event, event, event". You have a beginning followed by an event, followed by another event, followed by yet another event. (Kind of like the Olympics...) The students get this! I've been fighting this battle with teachers for years! The best example of a fictional expository book I've found is J. K. Rowlings Quidditch Through the Ages, and expository book of the rules of an imaginary game. When I put that book on the table, the conversations begin!